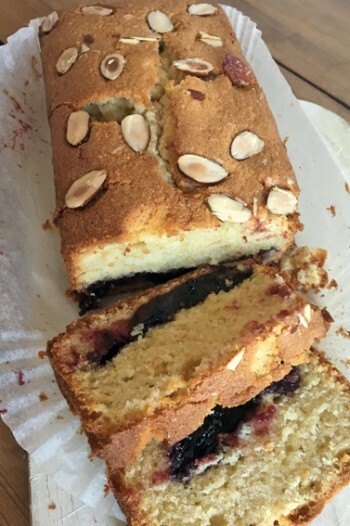 In our occasional recipe series, keen baker Jen Morris, of Rowney Green, creates a treat using fruity preserves. This is one of the busiest times for preserve-making and this cake shows off whatever jam you have, with a surprise centre. Everything goes into the bowl to be mixed together, so the batter is easy and quick to make. The jam is then added and baked inside the cake, so it comes out like a ready-assembled Victoria sandwich. I used homemade damson jam, but it works equally well with plum or blackcurrant jam, bramble jelly or anything that needs using up! 1) Heat oven to 160C/ 140C fan/ Gas 3. Lightly grease and line a 900g loaf tin. 2) Add the flour, ground almonds, butter, sugar, eggs, essence and milk into your mixing bowl, and beat with a hand-held electric mixer for 2–3 mins, until light and fluffy. 3) Spoon half the mixture into the tin, and spoon the jam evenly over the top. 4) Cover with the remaining mixture and then swirl the cake mixture and jam together briefly, using a skewer. 5) Smooth the top and scatter over the flaked almonds. 6) Bake for 1 hour 15 mins, until firm to the touch. You may need to cover it loosely with foil for the last 30 mins, to stop it catching. 7) Leave to stand in the tin for 10 mins, before removing to a wire rack to cool completely. Serve on its own for afternoon tea, or with some cream as a dessert.